Sunshine Coast specialists in European and Prestige Car Services. From Full Log Book Servicing to complete restorations, or just a quick driveway check before you take off on holiday, your vehicle is in great hands with the master auto technicians at SVS Autocare, plus all our work is guaranteed. SVS Autocare’s team of specialised auto technicians provide full log book servicing on new, out of warranty, pre-loved or much-loved cars. Keep your vehicle safe with brake servicing to ensure your brakes wear evenly and don't screech or squeal. or pick-up and drop-off rides so you can enjoy the day while your car is cared for. Whether you’re craving speed, power, economy or good looks we can deliver all that and more when you bring your car to the SVS Autocare workshop. If it’s getting too hot to handle, keep your cool and come and see our master technicians in Kunda Park on the Sunshine Coast. We realise how busy it is running a fleet of vehicles; have our master technicians service them and then return your fleet in a timely fashion. Noticed something a little off with your steering? Perhaps you keep veering to one side of the road or find yourself constantly having to correct your wheel to one side? We're pleased to announce the Guardian Vehicle Alcohol Interlock System for drink driving offences and business fleets to reduce risk and safeguard your family. Complete the annual RWC inspection detailed below at the South Brisbane site, this includes Uber drivers. Is your big beauty too big for standard workshops? SVS Autocare South Brisbane loves large commercial vans! 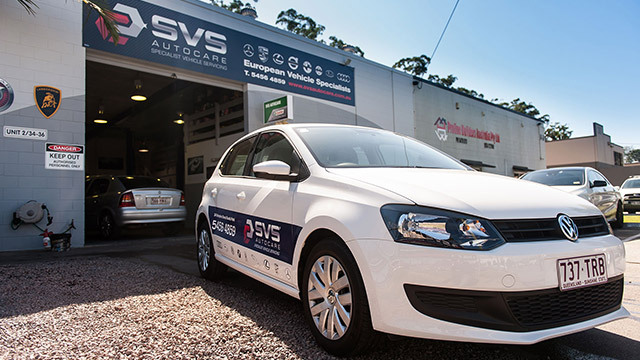 To thank our valued customers for their loyalty and friendship we have introduced the SVS Autocare VIP experience – ask our team if you qualify next time you visit the workshop and find out more! A few months ago I had an issue with the timing chain on my Mercedes CLS. This immediately became a MAJOR problem when I received a quote from the local Mercedes dealer for over $19,000!!! As I was familiar with SVS as European Vehicle Specialists I figured I should get a second opinion. They had a look at our car - apparently it was a common issue with the model. When they came back with their quote at under $4,500, I could not believe the difference in the price. They did a wonderful job – as expected, but what I didn’t expect was the level of customer service provided by the whole team. They explained everything that needed to be done in detail, provided a loan car for the day and even detailed the car before I picked it up. Since then we have our cars serviced by SVS and have recommended them to many friends and business colleagues. My husband recently purchased a Maserati from a prestige car dealership in Brisbane and he is completely confident having SVS look after his 'prized possession'. We would not hesitate in recommending SVS Autocare.